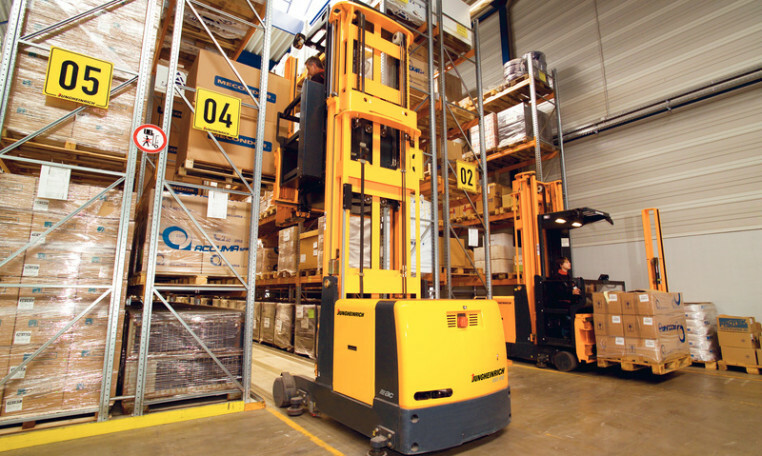 The Jungheinrich EKX 410 high-rack turret truck and order picker, with 2,200 lb. capacity, is designed for narrow aisle applications and can be used for full pallet put-away and retrieval as well as for picking individual boxes or pieces. With lift heights up to 30 feet, this turret truck sets new standards in terms of flexibility, efficiency and ergonomics. 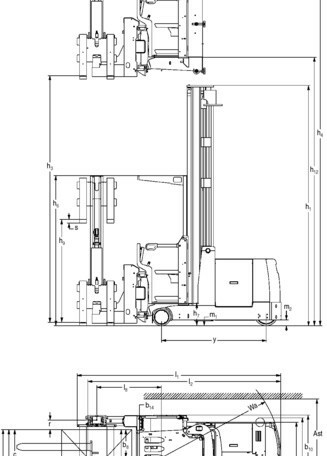 The new EKX 410 is designed to operate longer, reach higher lift heights and maximize efficiency. There are a variety of optional packages and systems available, including RFID ground control and the Jungheinrich®warehouse navigation system. 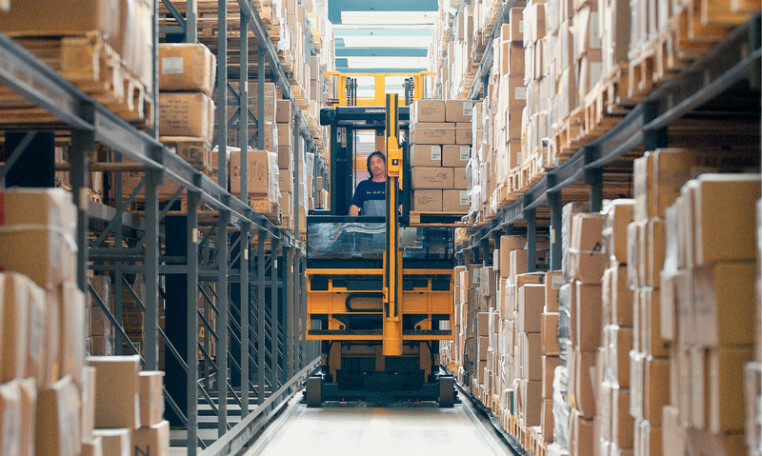 The EKX 410 man-up turret truck is available with optional transponder technology and warehouse navigation, which allows for maximum levels of productivity and security as lift truck performance can be tailored to the specific conditions of multiple areas within the warehouse. The EKX 410 turret truck is equipped with 48 volt 4th generation AC technology, which helps provide outstanding performance while driving, lifting and steering the forklift. Stepless speed control of hydraulic motor. High torque for excellent responsiveness. Reduced forklift maintenance by elimination of components susceptible to wear (carbon brushes, commutator, contacts, etc.). During reclamation lowering of the forks, energy is fed back into the battery of the forklift. Energy is also fed back into the lift truck system during braking (regenerative braking). Energy reclaimed in this way is available for subsequent energy consumption. Longer forklift operating times on a single battery charge (up to two shifts in most applications). Shorter battery charging times with prolonged battery life at the same time. Double energy saving benefits through regenerative braking and lowering. 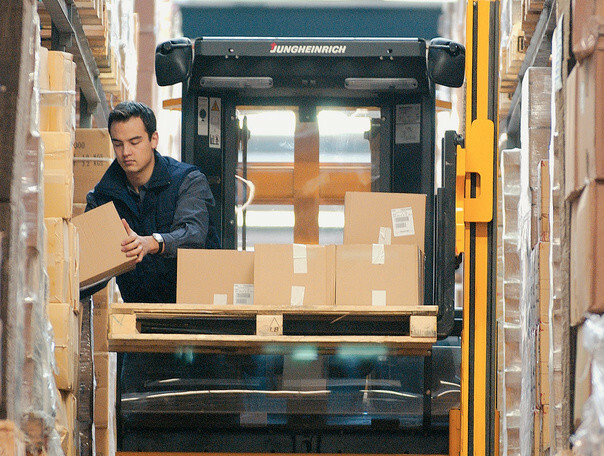 Jungheinrich's® modular system has more than 5 million configurations, providing flexibility right from the start and allowing the forklift to be tailored specifically to the application. 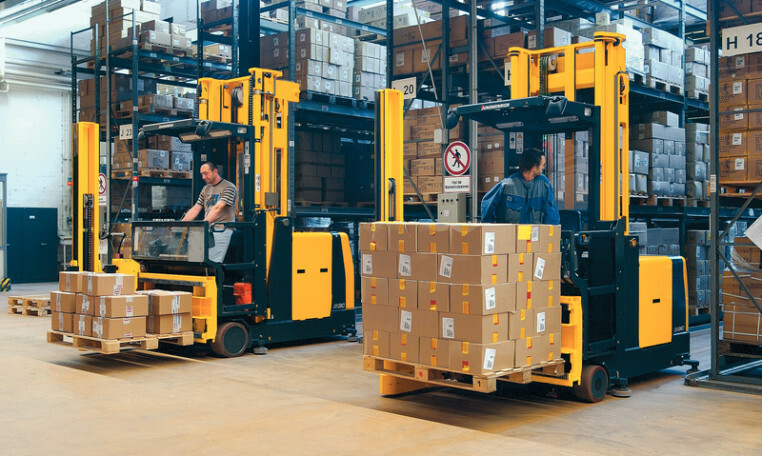 Intelligent management system with certified control and CAN-Bus system allows for continued flexibility and the ability to adapt the lift truck to changing requirements. Adjustable speed profiles in and out of narrow aisles. Easier and less expensive care of components. Optimum energy consumption due to excellent efficiency factor in all motors. Optimized thermal economy allows the use of corrosion-free, heat-resistant plastic containers for hydraulic oil. 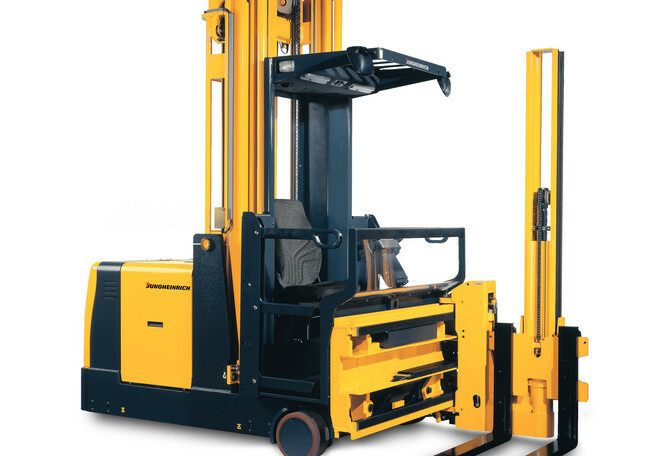 The lift truck cab offers a generously-sized operator compartment with outstanding visibility of the load and the aisle due to the low swiveling side shifting turret head. Strobe lights located under the cab and on the back of the forklift act as an additional warning device, helping to alert personnel in the surrounding area when the truck is in operation. At the center of the operator’s cab is the electrically-adjustable control panel. Easy viewing of key operating data available via color display. Drive/hydraulic control via thumb operation. Two- or one-handed operating concept for maximum safety. Sensors register the forklift operator‘s touch and send this information to the onboard computer. Adjustable and foldable cushion seat. 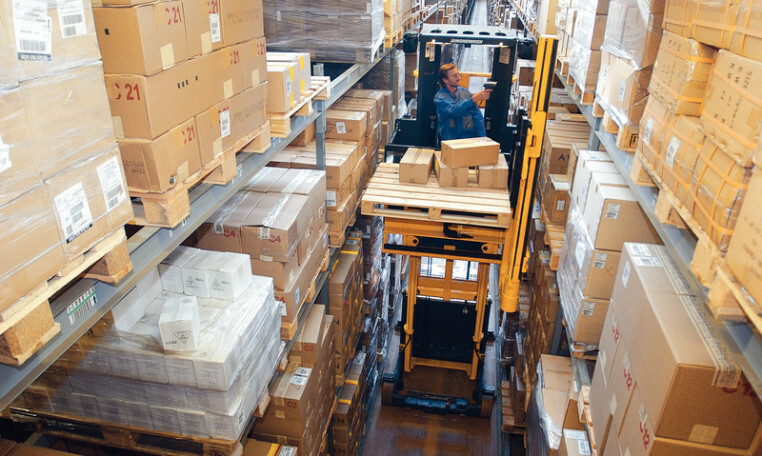 There are a variety of optional packages and systems available, including RFID ground control and the Jungheinrich® warehouse navigation system. The EKX 410 man-up turret truck is available with optional transponder technology and warehouse navigation, which allows for maximum levels of productivity and security as lift truck performance can be tailored to the specific conditions of multiple areas within the warehouse.